If you put your portfolio on autopilot over the summer, you need to dial back in yesterday. Because you’ll need a sharp eye and a quick hand to dodge two pitfalls that could swamp regular folks now—this month!—and in the long run. For the first one, look no further than the calendar. 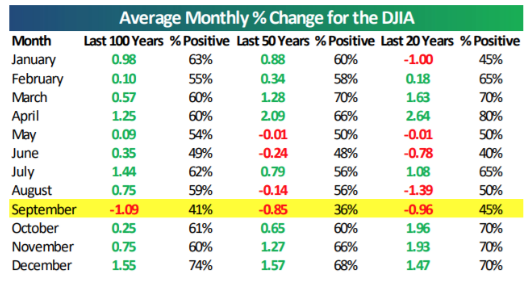 I’m talking about seasonality, and the fact that September is typically the worst month for stocks. The truth is, the market’s steady grind higher has stalled: through the first 5 trading days (and with 15 more to go), the Dow is off 0.8% and the S&P 500 is down 0.4%. The latter also trades at a ridiculous price-to-earnings (P/E) ratio of 24! Now before you shrug me off here, keep in mind the September swoon is backed by 100 years of research. According to fresh numbers from the Bespoke Investment Group, the Dow Jones Industrial Average has dropped an average of 1.09% over the last 100 years in September (and we’re almost there already! ), compared to an average gain of 0.73% for all the other months. Sure, 1.09% doesn’t sound like much of a drop, but remember it’s an average. Many Septembers are worse, such as in 2011, when the S&P plunged 6.4% on the month. Before we go further, let me be clear about one thing: I’m not for a minute suggesting you sell your stocks and run for the hills. This brings me to the second pitfall: giving in to the temptation to jump into big-name consumer-staples stocks, thinking their household names make them safe. 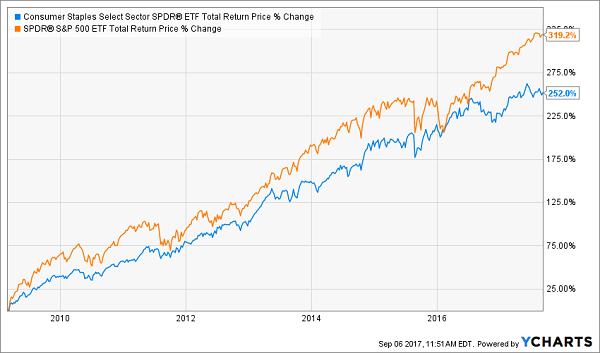 I’ve never understood the logic here, because the S&P 500 has crushed the sector since the financial crisis, even with dividends included! I expect that gap to get wider still. To see why, let’s dive into the first big-name pretender you need to toss now. Mondelez International (MDLZ) is a good illustration of the headache the entire sector faces: consumers turning up their noses at packaged food and loading up on fresh fare instead. Together, these names hauled in 72% of second-quarter revenue—but their sales sank 3% from a year ago, while Mondelez’s total revenue fell 5%. But you wouldn’t know it from earnings per share (EPS), which were up 10% (or 19% on an adjusted basis). The company hiked its dividend 16%. It’s not hard to see where these hikes are coming from: cost cuts—and that’s not sustainable in the long run. Worse, Mondelez paid out a somewhat high 64% of its earnings as dividends, so shareholders might not see another double-digit payout hike for a while. Meantime, investors still shell out 36 times trailing-twelve-month earnings for this stock. That bakes in too much risk for the 2.2% forward dividend yield you get. But if you’ve been riding this sugar high, now’s probably a good time to put this weary Dividend Aristocrat on ice. Why? Because its trailing-twelve-month P/E ratio is fizzing away at 49, ridiculous for a company that still leans on sugary drinks—even as soda consumption circles the drain. And sure, Coke beat expectations on the top and bottom lines in the second quarter. Too bad the Street was expecting both to shrink. Coke’s revenue fell for the ninth straight quarter in Q2, with a 16% year-over-year drop in net revenue. EPS plunged 59%, but by just a penny on an adjusted basis. You are getting a nice 3.2% forward yield if you buy Coke today. That’s good, because any real payout growth is a long way off: Coke pays an uncomfortable (in my book) 73% of its earnings as dividends—and 111% of free cash flow! You read that right: Coke is paying out more in dividends than it’s generating in FCF. To be sure, this 125-year-old icon isn’t going away, but I know I don’t have to tell you that overpaying for a stock with numbers like these is a recipe for disappointment. General Mills (GIS) boasts the highest yield of any of our three laggards, at 3.5%, but that’s not because the packaged-food giant has been dishing out fat dividend hikes—it’s because its shares have plunged 23% in the past year. And if you want to get a sense of what could be in store for the levitating stocks of Mondelez and Coke, take a look at what’s happened to General Mills. Like those two icons, the company’s top brands feature a who’s-who of packaged foods, including Pillsbury, Cheerios, Chex and Nature Valley. 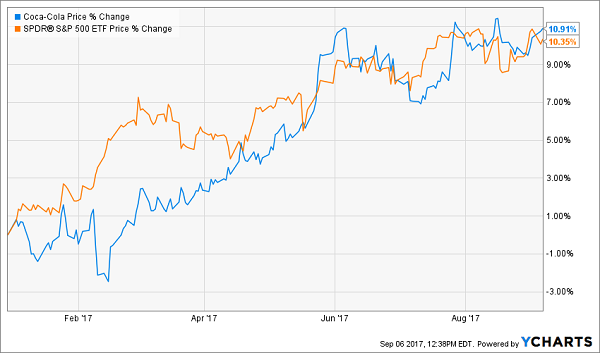 And like those two icons, the shift toward fresher fare is showing up in its results, with EPS gains generated by cost cuts, not sales growth: in its fourth quarter (which ended May 28), General Mills’ EPS rose 11% from a year earlier (or 14% on an adjusted basis), while net sales dipped 3%. Management expects cost cuts and restructuring to keep driving EPS: for fiscal 2018, it’s calling for a 1% to 2% sales decline while adjusted EPS rises 1% to 2%. Meantime, dividend growth is stuck in the freezer, with General Mills paying out 68% of EPS and 70% of FCF as dividends in the last 12 months. We’re already seeing the effects: the latest hike to its quarterly payout, announced in June, was just $0.01. The stock’s P/E ratio sits at 19.6, below the five-year average of 21.3. But that number will likely go lower as management struggles to find new sales growth. And consider this: if GIS were to drop to its lowest P/E in the last five years (14.8; entirely possible, in my view), it would slice another 25% off the share price. 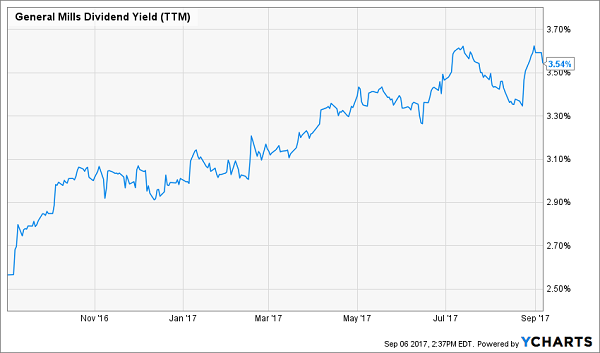 I’ve just uncovered 7 dividend-growth stocks that are screaming buys now—no matter what the calendar says! In fact, I recommend you don’t wait another day to get in, because the longer you hold off, the more gains (and income) you’ll miss out on. I’ve spent hours sifting and analyzing to zero in on these 7 low-key income plays, and I’ve come to one conclusion: they can easily grow your money 12% a year FOREVER—doubling your portfolio every 6 years! 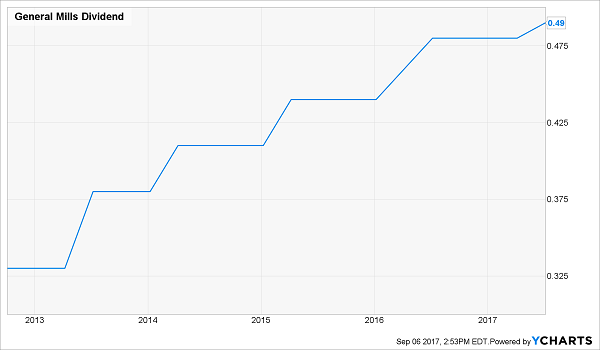 An Easy Dividend Double: This company boosted its dividend 107% in the past five years and continues to fill shareholders’ pockets at a quicker pace! Plus it has $4.8 billion in CASH parked overseas, and if President Trump gives a tax break on money brought back into the US, this stock will drop A LOT of cash into the laps of investors who get in now. The 800% Income Machine: This company’s dividend has exploded eightfold since a dynamic management team took over four years ago, PLUS they’re expertly buying back stocks to goose the share price even more. This one is a complete no-brainer for anyone looking to pocket bigger and bigger dividend checks from here on out! The 250% Gainer: This one trades for a ridiculous 6 TIMES cash flow—and the last time that number fell below 10, the stock exploded on a monster 252% run! The stars are aligning for a repeat, but the dividend and management’s smart buybacks alone could push your investment up 12% or more. I’m ready to share full details on these stocks and 4 more red-hot dividend-growth plays now. All you have to do is CLICK HERE go get my complete research, including each stock’s name, ticker and buy-under price.